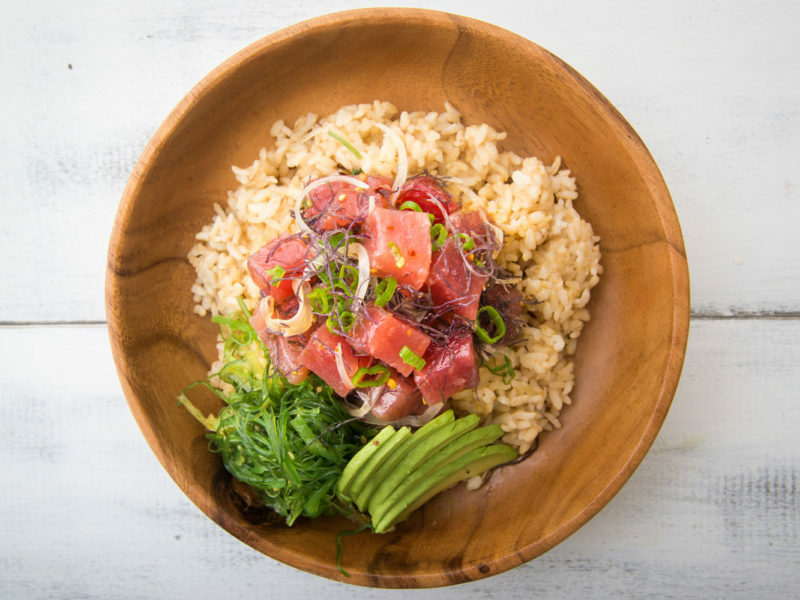 The famous poke bowl - A crowd favourite and a must-try when you're in Hawai'i. Think Hawai’i is all about surfing and beaches? Think again, Hawai’i is the capital of food cool with cocktails plenty and quality local produce. With a tropical climate that lends itself to a sundowner or two, these distilleries are brewing up something great. It was the Polynesians who initially brought sugar cane to Hawai‘i, and the first sugar mill was established in Lāna‘i in the early 1800s; commercial cane fields were established at the town of Koloa on Kaua‘i in 1835. Since then the crop has been used to make everyone’s favourite island tipple, rum. Even if you’re not a rum-lover, a visit to the Koloa Rum Tasting Room and Company Store at the historic Kilohana Plantation in Lihue will set you on the path to appreciation. Koloa’s rums are premium, single-batch, made using the kind of sustainable practices that are fast becoming the standard for businesses across all of the Islands of Hawai‘i. Meanwhile, on the island of O‘ahu, Manulele Distillers at Kunia has a farm-to-bottle philosophy when it comes to producing its celebrated Kō Hana Agricole Rum. The heirloom varieties of sugar cane (kō in Hawaiian) used to produce its small batch, single variety white, barrel-aged and cask strength rums are all hand-harvested before being pressed for juice and distilled with care. The resulting spirits, considered to be some of the best pure cane rums in the world (many mass-produced rums are made with molasses, a by-product of sugar production), are presented in sleek cube bottles with glass stoppers and hand-numbered on site. Hawai‘i’s abundant sugar cane is not just utilised to produce rum; on the island of Maui, sustainable, select harvested organic sugar cane is combined with deep ocean mineral water, sourced some 900 metres below the Kona Coast off the Island of Hawai‘i, to produce a uniquely Hawaiian vodka, Ocean Vodka. The water used is purified and desalinated through a natural filtration method that ensures it retains its rich mineral content, while no GMOs or pesticides are used. The bottles resemble antique glass fishing floats. With a growing focus on utilising sustainable farming practices, as well as its abundant natural resources, Hawai‘i has earnt a reputation as a destination creating quality food and drinks from its deliciously fresh produce. This kind of attention to detail and respect for the environment is encapsulated in places like O’o Farm, located at 1066 metres on the slopes of Haleakala in the upcountry farming community of Kula on Maui. The passion project of surfing buddies Louis Coulombe and Stephan Bel-Robert, who purchased the land here in 2000 with a citrus and stone fruit orchard and a few coffee trees attached, O’o Farms is now a thriving ‘no-till’ farm growing Hawaiian coffee, fruit trees, garden vegetables and greenhouse tomatoes, flowers and herbs. Given the cornerstone of Hawai‘i’s unique cuisine is island-fresh local produce and ingredients, it should come as no surprise that there is also no shortage of farmers’ markets to visit. Some of the best on offer include Hilo Farmers Market on the Island of Hawai‘i (Wednesday and Saturdays, 6am – 4pm); KCC Farmers Market across from Diamond Head in Waikiki (Saturdays 7.30am – 11am) or Hale‘iwa Farmers Market on the North Shore (Thursdays, 2pm – 6pm); Kaua‘i Culinary Market at Poipu on Kaua‘i (Wednesday, 3.30pm – 6pm); and Maui’s Upcountry Farmers Market in Pukalani (Saturdays, 7am – 11am). The best way to see (and taste) the traditions and practices of farming on Hawai‘i first-hand is on one of the many farm tours available across the Hawaiian Islands at places like the Surfing Goat Dairy in lower Kula on Maui, which supplies its award-winning cheeses to restaurants across the island, and Big Island Bees on the Island of Hawai‘i, where you can take a beekeeping tour and join in on opening a bee hive. And for the sweet toothed, Garden Island Chocolate on Kaua‘i produces organic dark chocolate (85 per cent cacao) which you can sample on its guided chocolate tour. Another way to experience Hawai‘i’s paddock to plate ethos is on a rambling culinary home tour, which gives an irresistible taste of the island lifestyle. Home Tours Hawai‘i on the Island of Hawai‘i offers its guests the chance to enjoy a progressive 3-course ‘farm to fork’ brunch using fresh ingredients and prepared in private homes. One of the most delicious culinary exports from Hawai‘i food exports is poke (‘to slice’ in Hawaiian), which originated when local fishermen seasoned off-cuts and ate them as a snack. Traditionally served as an appetiser or main dish (the cubed fish is seasoned with salt, soy and sesame oil and mixed with Maui onion, ground candlenut and algae), it has evolved into a popular salad served with accompaniments ranging from avocado to coleslaw to rice. Hawai‘i has a reputation for growing great coffee beans. Coffee arrived in Hawai‘i in 1817 and after a few years of patchy success at growing, plants were successfully introduced onto the Island of Hawai‘i in 1828, with the first commercial operation starting up in Koloa on Kaua‘i in 1836. As sugar cane became less profitable many farmers started growing coffee beans instead; now more of Hawai‘is farmers grow coffee than any other crop across Kaua‘i, Maui, Moloka‘i and Island of Hawai‘i. So it’s not surprising that there are some serious brews to be had; here a few coffee spots to hit up for a heart starter on your next visit. Poipu and Hanapepe, Kaua‘i Order hand-brewed coffee using organic Hawaiian beans and feast on dishes constructed of locally grown produce. Maui Housed in a light, airy space in Kihei, the coffee here follows a seed-to-cup process, serving up 100 per cent locally roasted Maui beans. With three cafes on O‘ahu, this consistently good coffee, made with Kona beans, is a must. The best organic Kona beans are used in its brews, including the coffee ice cubes in the iced version.